The greatest football quotations collection ever, now in its ninth edition. 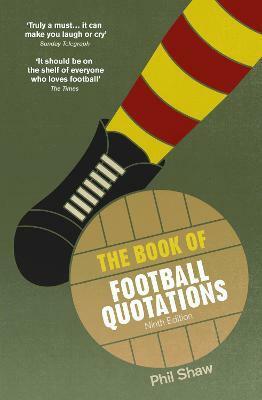 This compilation includes quotes from everyone - Shakespeare to Suarez, Camus to Cantona, Busby to Beckham - who has made an apt, pithy or comical comment about football. And not just footballers and managers either - fans, pundits, groundsmen, directors and wives all get to have their say too. Every subject is covered, from tactical debates to changing lifestyles, to produce a sometimes hilarious and always thought-provoking commentary on the game. "It should be on the shelf of everyone who loves football"
Phil Shaw is a sports writer for the Independent. He has previously written for the Guardian, Observer and Time Out. Along with seven editions of The Book of Football Quotations, originally in collaboration with Peter Ball, he has written Whose Game Is It Anyway? a book about football fanzines. A Leeds United fan and veteran reporter of three European Championships and four World Cups, Phil lives in Staffordshire with his wife and children.